Sanskrit Academy is an organization founded by Dr. Sarasvati Mohan. The mission of the Academy is to promote the study of Sanskrit language and culture. The academy offers several resources to aid those interested in learning Sanskrit. Well-designed and structured courses are offered via in-person or correspondence. There are publications in the form of study materials, games and learning aids. Dr. Sarasvati Mohan studied Sanskrit under a tutor Pandit in the traditional method from the time she was six years old. She got her Masters and Ph.D. in Sanskrit at Madras University, doing research in unpublished manuscripts of Sanskrit literature. Dr. Mohan has taught for more than four decades. Students enjoy her vast knowledge, experience and articulate teaching methods, which blend both eastern and western techniques. Also her technique of reference method is very successful and encouraging even for people frightened by the old traditional rote method. Dr. Mohan was on the faculty of Madras University, India and also of Wesleyan University in U.S.A.
Vishwa Krishnamurthy is a senior student of Dr. Sarasvati Mohan. He has been studying under her since 1999. He has an immense passion for sanskrit. 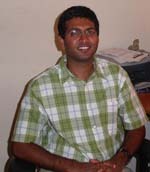 Vishwa Krishnamurthy enjoys teaching and teaches sanskrit in San Jose, California. He has been teaching since 2003. Students enjoy the classes and in fact seem to dislike missing any of the classes. He offers several extra practice worksheets to help both kids and adults understand the concepts better.